The Urban Jungle is responsive, with great maneuverability, but there's little on-board storage. 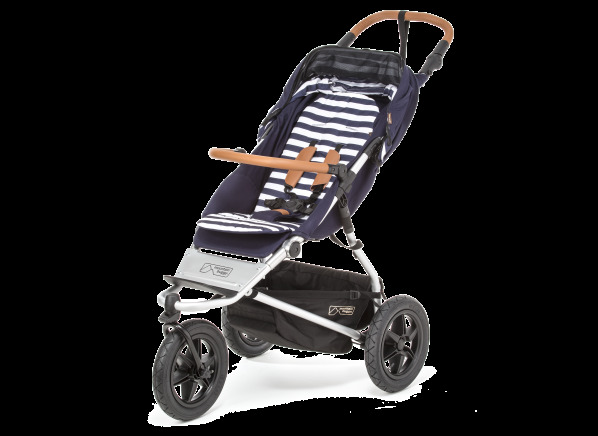 The Mountain Buggy Urban Jungle is part of the Stroller test program at Consumer Reports. In our lab tests, Stroller models like the Urban Jungle are rated on multiple criteria, such as those listed below. Ease of use: Ease of use is based primarily on ease of using and adjusting the safety harness, folding and unfolding, adjusting the backrest, lifting and carrying, engaging wheel brakes and car seat removal and installation (only for compatible strollers). Maneuverability: Maneuverability is assessed by trained testers, taking into account how well each stroller, with a weight bag "passenger," maneuvers on our course: in S-turns through cones, in narrow sections, on grass, dirt trails with tree roots and other debris, uphill, downhill and up and down curbs. Safety: Safety is assessed by testing to the requirements of the federal stroller safety standard, 16 CFR Parts 1112 and 1227, which incorporates, by reference, the most current version of the ASTM stroller safety standard, ASTM F833-15. We also put strollers through Stability and Braking and other tests designed by CR. 5-pt harness 5-pt harness A five-point harness secures child firmly. Unlike a three-point harness, it has shoulder straps and secures the upper body. Suitable for 6 mos. and under Suitable for 6 mos. and under Suitability for babies 6 months and younger means the stroller's seat reclines to nearly flat. It may include a safety flap or enclosure at the child's feet so, if not harnessed, he can't slip or wiggle out of the seat. Even with this added feature, the harness should always be used. Car-seat compatible as sold Car-seat compatible as sold Car-seat compatibility is useful when moving a sleeping infant from a car to the stroller; there's no need to wake your baby from that much-needed nap. In our Ratings, strollers designated as "Car-seat compatible as sold" include any and all accessories needed to install at least one model of infant car seat. Some strollers allow a car seat to snap right in, while others may need a bracket or other adapter. One-touch brakes One-touch brakes One-touch brakes are more convenient than standard brakes. Arguably still more convenient - and certainly more friendly to parents wearing open-toe shoes - are hand-operated one-touch brake levers such as those found on some Baby Jogger, Chicco and other strollers. Adjustable handle Adjustable handle An adjustable handle can accommodate parents or caregivers of different heights. Stands folded Stands folded Strollers that are self-standing when folded are convenient in restaurants or other tight spaces. It also makes storing at home easier. Weight (lbs.) Weight Weight of stroller with included accessories and stroller seat installed (if removable). Suitable for running or jogging Suitable for running or jogging According to the manufacturer, this stroller can be used for running or jogging. Remember to check with your pediatrician before taking your little passenger along for a run; CR's medical experts advise that a child should be one year old before riding with a running parent. A younger baby may not have sufficient head and neck control to tolerate the bumps and jounces he might experience on your run. Be sure to read the appropriate section of your stroller's instruction manual carefully before taking your child out for a run with you.